Through its official Weibo account, AKB48's sister group based in Shanghai 'AKB48 Team SH' has announced about their first single (EP). Apparently the single has been prepared carefully and is just waiting for the launch. 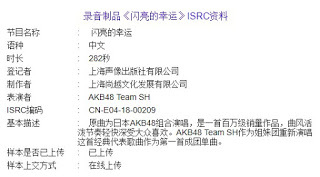 This is known after the company that oversees the AKB48 Team SH is Shanghai Shangyue Development Co. Ltd. (上海 尚越文 化 发展 有限公司) just registered the songs to the ISRC center. Two of the AKB48 songs that will be delivered by Team SH are known to be registered and will be part of the track of the first single. The song is Heavy Rotation or Shan Liang de Xingyun (闪亮 的 幸运) and LOVE TRIP. The Love Trip song has the same title and is not converted into Chinese hanzi or letters. All songs will be sung in Chinese by AKB48 Team SH members.